Registries in SuperMemo are sorted sets of objects such as texts, pictures, fonts, templates, categories, tasklists, stylesheets, etc. Each registry is composed of a set of registry members, which are named objects used by the collection. Important! Registries in SuperMemo have nothing to do with the Windows registry (SuperMemo have been using registries before the release of Windows 95)! An image registry is a set of image files sorted by image names. The picture presents a typical image registry. There are 11210 images in the registry (as displayed in the caption). Image names are displayed on the left. 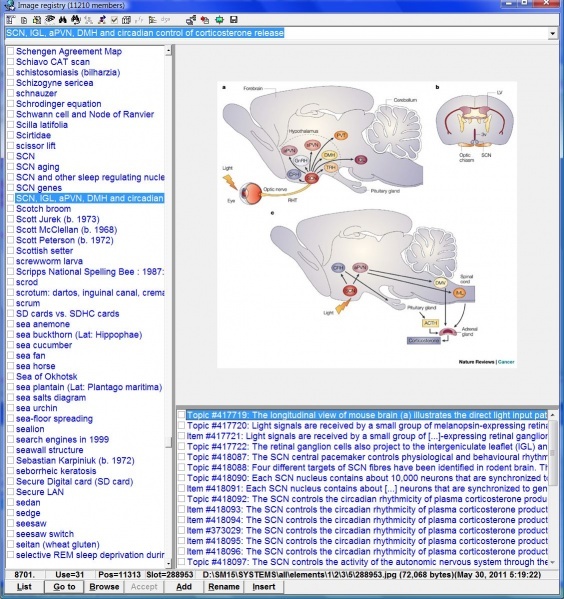 The currently displayed picture is one of SCN, IGL, aPVN, DMH and circadian control of corticosterone release. Individual elements in SuperMemo can focus on small portions of this large picture. The list of elements using a given picture can be displayed at the bottom by clicking List. The status bar displays selected information about the current image. It is the 8701st image in the alphabetical order. It is used by 31 elements (items or topics). It is located on physical position 11313 in the registry. It occupies the file slot 288953 in the ELEMENTS subfolder. Its path and filename in the element folder is displayed next. The file is 72,068 bytes large. It was imported or created on May 30, 2011 at 5:19 am. By using registries, SuperMemo minimizes the space used by multimedia files by making sure that each object is stored only once and used by as many elements as necessary (through the access to the registry via so-called registry links). For example, if you import an image file into an image component of a given element (using Import file), you can later link the same image file with another image component by means of Links : Registry member. By default, the name is the same as the original image filename, but you can change it at import or later on (e.g. with Alt+R if the image component is the current component). The lexicon registry stores all words used in a collection. The difference between the lexicon registry and the remaining registries is that individual words are not stored as links to a registry; therefore, deleting a word from the lexicon registry does not delete it from the collection. Instead, this word becomes unavailable from Search : Lexicon. Newer versions of SuperMemo do not automatically build the lexicon for performance reasons. To build a lexicon check Rebuild lexicon while running File : Repair collection. Note that this process takes very long even for smaller collections. Text translations are also stored as registries. These are equivalent to text registries and can be easily replaced by means of copying and renaming registry files. For example, if you have translated your collection to German by creating a translation registry called German, you can copy German. * to text. * in the REGISTRY subfolder and your original texts in the collection will be replaced with their translations to German (note that you will need to rebuild the lexicon in order to generate a lexicon of German words). Components which use particular registry objects store only registry references, not objects themselves. For example, a sound component may store a reference to a sound registry for its sound file, and to text registry for its text. This approach makes sure that large objects (e.g. video files) can be reused without wasting disk space. Each time you import an new object with Import file on the Component menu, you add it to the appropriate registry. Similarly, each time you type a new text to text, spell-pad or sound components, you add it to the text registry.